Finding a place to park your bike at Penn Center next to Temple Center City Campus and the elevator down to Suburban Station is now down to finding a vacant spot on the railing... any railing. My count is about 40 bikes located inside this photo, what you cannot see is a second crappy school rack crammed with bikes. 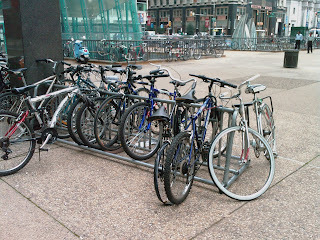 The bikes wrap around the rest of the railing as well as the inverted U racks and signposts on the JFK Blvd sidewalk. Bike Station anyone? Do you recall this conceptual drawing at the old visitors center? The building is directly across the street from this plaza.